1. I slept for 13 hours last night. It was glorious. Love. 2. Yesterday, I owned my race. 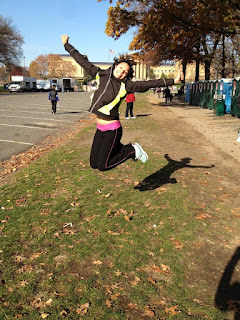 My new running mantra (which I developed somewhere around Mile 9) became "Own your race." I didn't put everything out there but I still finished strong and fast. Now, I have my sights set on a winter Half-Marathon that I can truly own and test my limits and see just how fast these little legs can carry me. Love. Woo! Look at me! I PRd! 3. 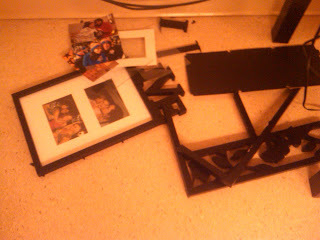 I came home last night to find the picture frames I hung on my wall last week on the floor, shattered to a million pieces. So much for posting photos of my apartment this week. Don't Love. 4. I'm starting to get a tiny bit excited for the Holidays...you know, now that they actually start this week and it's appropriate to do so. Love. 5. The Pilot and I have plans to go see Macy's inflate all of the balloons for the Thanksgiving Day Parade but now it's supposed to rain. I swear I feel like it rains at least twice a week in New York. Don't Love. 6. 3 more weeks! 3 more weeks! 3 more weeks! Love. 7. Those 3 weeks involve a lot of paper writing...which is what I will be doing on Thanksgiving Day, Black Friday and through the weekend. Goal = write 2 of 3 final papers this weekend. Don't Love. 8. I just found out I don't have to work on Wednesday which means as of 6pm tomorrow I'm free! Love...To go write papers. Don't Love. It's the start of a short week for everyone! What are you loving and not loving this week? Who's doing something exciting for Thanksgiving? That stinks about the frames! Love your blog and PR. Don't love that M is at home right now, and I'm in the office. Love that it's a short week. Don't love that it's not 5 o'clock yet. jumping after PRing = worst idea ever. Yay, I am running a turkey trot on thanks giving of 8.5 miles! Hopefully Ill do as well as you! Congrats on your amazing PR! I am so happy for you, Christy! Enjoy these last few days and have a wonderful holiday! What winter half are you looking at? I have a feeling I'm going to sleep for a *long* time tonight-after a few days of waking up 3:30am, then 5am, and long full days, I'm ready for a good sleep! Congrats on a great race! And, I HATE when things fall off my wall - it happens all the time to me. Going to a tennis tournament at Thanksgiving -- oh yeah.... exciting stuff.